Darkly colored yarn gets a bad rep. It can be difficult to see and work with, especially without adequate lighting or set-up. Some people avoid working with black yarn completely. That’s a shame, because there are some truly beautiful dark yarns out there, and who doesn’t love a super-cozy charcoal gray or black sweater? They go with EVERYTHING. 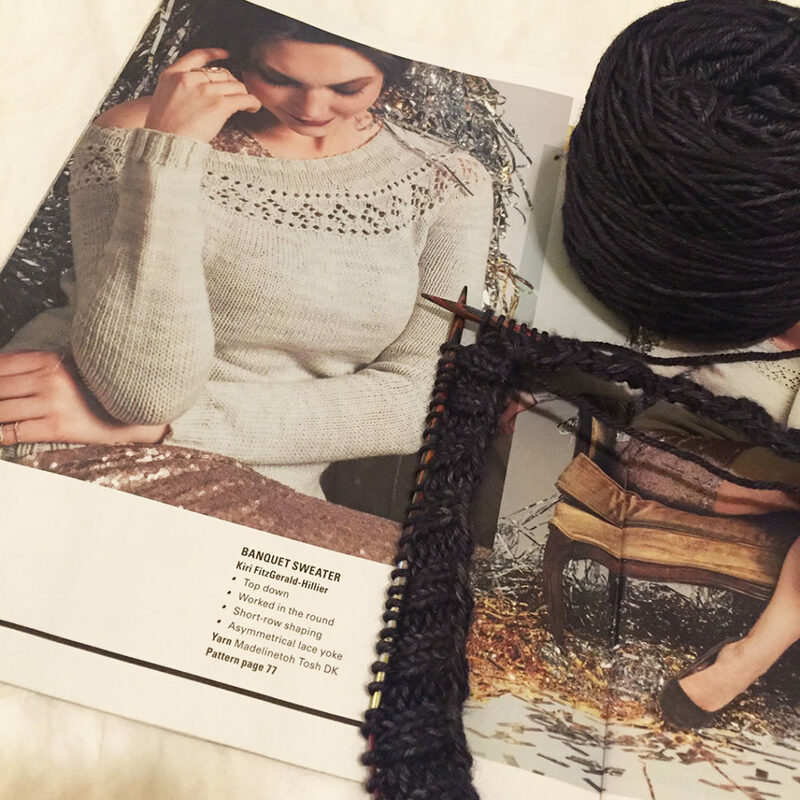 In order to convince more people to fearlessly knit with dark yarns, editors Meghan Babin, Sara Dudek, and I got together and came up with a list of tips for knitting or crocheting with dark yarns. Tip #1: Use a headlamp. Yup, we’re going there immediately. 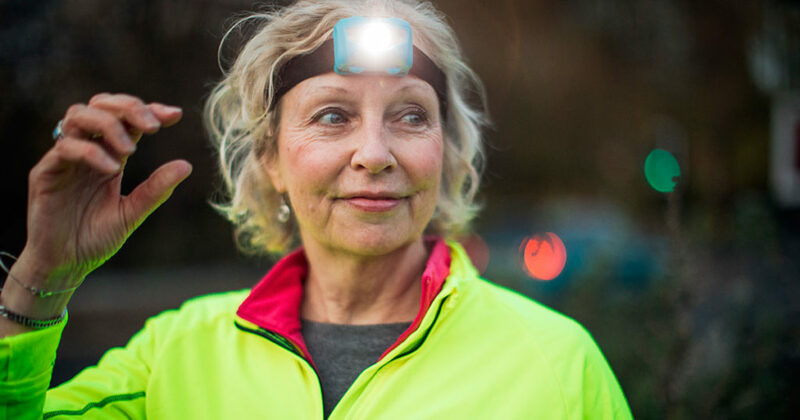 If you’re working with dark yarn and you can’t see what you’re doing, use your camping or biking headlamp that’s been sitting in your garage unused. It will directly illuminate your work so you’ll be less likely to make mistakes and have to frog your project. Tip #2: Don’t knit with dark yarn in a darkly lit bar. There’s a spot here in Fort Collins called The Forge where Meghan and I have spent several knit nights (you can see it in the photos of Interweave Knits Winter 2017). The lighting is very dark and yellow, which is great for a date, but bad for knitting with dark yarn. After making the mistake of trying to knit a black hat there one night, I decided that is NOT the place to knit with dark yarns. Since then I only take lighter projects to work on when I go to The Forge, and save the darker knitting for more adequately lit spaces. But of course, I could always just take my headlamp. Tip #3: Be ready to frog. Let’s get this out of the way. Just be ready for making some mistakes and having to tink (knit backward) or frog (rippit, rippit). It’s harder to see stitches in a darker yarn, and sometimes mistakes are just inevitable, especially depending on the pattern you are knitting and the lighting you’re working under. When this happens, just take a deep breath, and consider the fixing of your mistake as apart of the whole process (because it truly is). Tip #4: Use lifelines and chain spaces. If you’re knitting with dark yarn, use the old lifeline trick every ten rows or so, so that it’s easier to frog if you have to. If you’re crocheting with dark yarn, opt for a pattern that includes lots of chain spaces and openings so you can see the stitches more clearly. 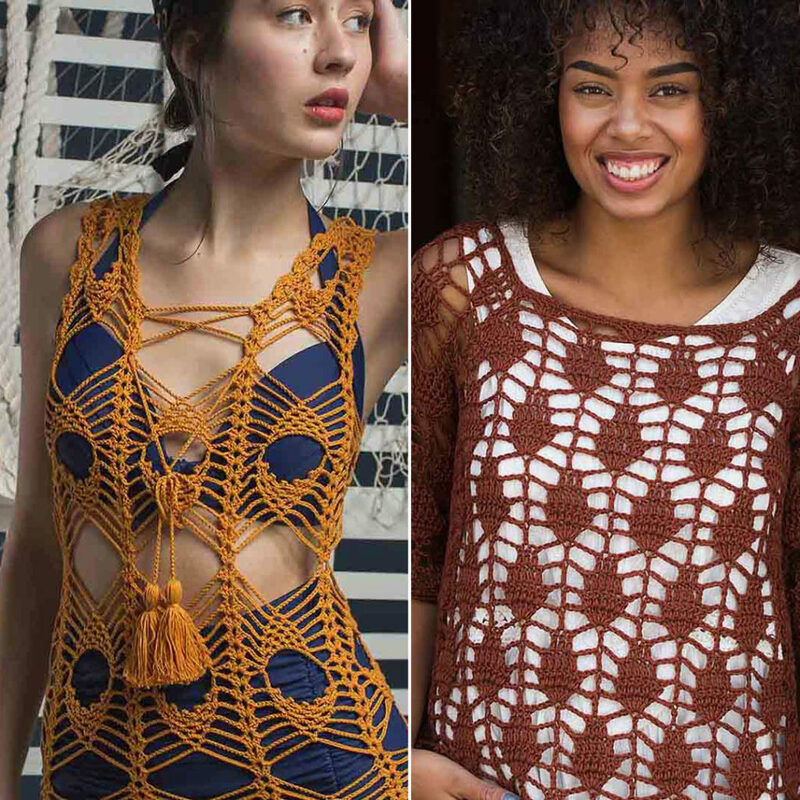 Find crochet patterns like the Coastal Tunic and the Dunraven Lane Tunic with lots of open space to try with a dark yarn. Tip #5: Wear corrective lenses. This probably seems like a no-brainer, but if you normally wear glasses or contacts, wear them while you’re working with dark yarn. If you don’t wear prescription glasses but are having a hard time seeing what you’re doing, try reading glasses! They are affordable and available at most local drug stores. Ain’t no shame in that reading glasses game! This is a generally great tip for any craft or creative activity. Looking at the same thing for several hours can really wear out your eyes, give you headaches, and just generally make you fatigued on what you’re doing. Keep an eye on the clock and an awareness of how your eyes and head are feeling. When it’s been some time since you got up and walked around, do it! Make a cup of tea, go for a walk, or whatever will help you reset. Just take a break and let your eyes and brain rest for a bit before returning to your dark-yarn project. Tip #7. Try using a semi-solid for variety. Working with a semi-solid can help break up the monotony of using a super dark yarn. You’ll be able to see the color pattern unfold right in front of your eyes and it will prevent you from getting bored! I knitted the Banquet Sweater from knitscene Winter 2016 in this beautiful semi-solid black yarn (I couldn’t find a photo of the FO! D’oh!). Tip #8: Use multiple colors. Incorporate some colorwork into your project and use other, contrasting colors along with your dark yarns. It will make the times when you use the dark yarn easier and gives your eyes natural breaks as you go. Tip #9: Work on a light surface. A really clever trick is to work on a light-colored surface. If you have a table you can work at that’s light, do it. If you don’t have a light surface in your home, it’s really as simple as finding or buying a lightly colored piece of fabric, or big piece of cardstock paper at a craft store. You can just set it on your lap and now you have a contrast background to work off of, which will help you see your project much better. Tip #10: Go fearlessly into the night! Don’t be afraid of working with darker yarns! If you generally like to wear black, knitting or crocheting something in black or another dark yarn makes sense for something you want to incorporate into your regular wardrobe rotation. And the more you work with dark yarns, the more you’ll get used to it and create pieces you really love. Have you ever tried any of these tricks? What tricks did we miss? Let us know how you prefer to work with dark yarns! 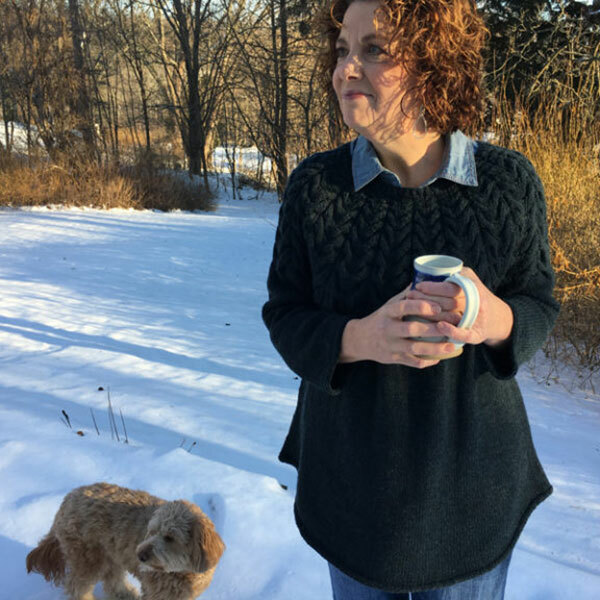 Look how amazing Meghan’s mom looks in this Angelina pullover Meghan knitted her for Christmas! Also, could Sydney the dog BE cuter? I don’t think so. Use the coupon code BFJULY40 and get 40% off today! Something that could be mentioned in “Tip #9: Work on a light surface” is the suggestion to use a white pillowcase. Most have one of these and then you would not have to buy fabric which might have frayed edges to contend with. Thanks! I need to get a headlight for night knitting. It makes a big difference in knitting dark yarn if I use LIGHT COLORED NEEDLES! Then each stitch is visible on the needle. Also , sit near a window to let daylight in. “They” DO make lighted needles! My DH bought me a set a few years ago. Look for them, especially on-line. It’s a must to use light needles. My favorite needles are symfonie rose cubics which are very dark and have a dark cord. Drove me nuts because I couldn’t see my stitches. Switched to nova platina cubics interchangeables with a light colored cord and daylight only knitting and the problem is solved. Love dark yarns! Could you knit or crochet with white (wool or cotton) yarn then dye it black? If you can, work with a non-splitty yarn and learn to FEEL your stitches. All are great ideas. However, I will never ever try and knit something in a black fur type yarn that has short rows. Been there done that. Cat enjoyed the failure that got thrown down on the table because no matter how many times I tried tinking, when you can’t see the stitch because of the “fur” in the yarn you just can’t do it. Otherwise, my headlamp is my best friend when I’m knitting in dark yarn. I try to knit dark colors during the day, and light colors at night. Contrasting colors of the yarn (light or dark) vs the needles (dark or light) sounds like a good idea, too!